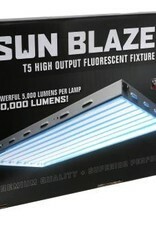 SUNBLAZE Fixtures include FREE pre-installed Spectralux 6500° K lamps. Home / Fixtures include FREE pre-installed Spectralux 6500° K lamps. 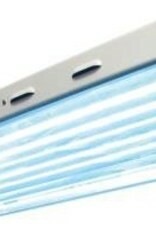 Fixtures include FREE pre-installed Spectralux 6500° K lamps. New wider advanced reflector design offers excellent reflectivity and diffusion. White powder coated steel housing. Wire cable hangers included with every fixture. Now you can choose to hang horizontally or vertically. 12 foot power cord and on/off switch allows for easy operation. Eight lamp model features two on/off switches to run four lamps at a time if desired. Louvered for cool operation. 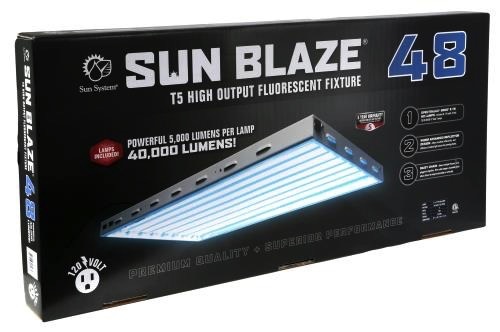 High output lamps have an extremely high lumen per watt rating. Run on 120 volt power only. 3000° K (red) lamps can be purchased separately. Daisy chain feature allows multiple fixtures to be plugged in together. New "eco-friendly" recyclable packaging.